BLU-RAY. Now available! Order now! HOME USE DVD. 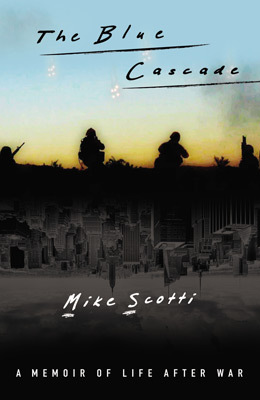 One of the most critically acclaimed films about the war in Iraq. “This visceral, gripping doc uses footage shot in Iraq to give us a clear-eyed, brutal, but decidedly unpoliticized look at the reality of war.” NEW YORK MAGAZINE. Only available from Sirk Productions at Deepdiscount.com, NOT available in retail stores. 93 mins. DVD contains full feature film and two bonus trailers. Note that these DVDs are for HOME USE ONLY and are not licensed for public, community or educational screenings. FUNDRAISING SCREENING KIT. Includes 1 Limited Public Performance Licensed DVD, 10 DVDs, 5 posters, 100 postcards and a discussion guide. The kit “pays for itself” because it includes enough extra DVDs to sell at the event to cover the cost of the kit, and helps you raise additional funds for your organization! We encourage veterans organizations, community groups, grassroots groups and individuals across to organize screenings, houseparties and actions around SEVERE CLEAR in an effort to support the sacrifices of our troops and issues such as post traumatic stress disorder (PTSD). DVD 10 PACK. 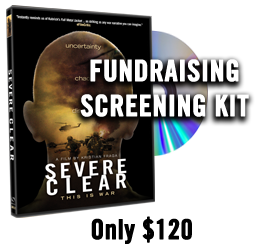 This kit provides additional DVDs for the Fundraising Screening Kit. NOTE: Public Performance rights are NOT included in this 10 Pack. The kit essentially “pays for itself” because you can sell the 10 DVDs for $20 and raise $100 for your organization! We encourage veterans organizations, community groups, grassroots groups and individuals across the country to organize screenings, houseparties and actions around SEVERE CLEAR in an effort to support the sacrifices of our troops and issues such as post traumatic stress disorder (PTSD). EDUCATIONAL LICENSE. 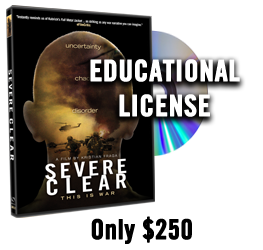 This version of SEVERE CLEAR includes a site license for public performance and educational use in universities, colleges and public schools. This license is not designed for events where you charge admission. We encourage universities, colleges and public schools to organize screenings and educational courses around SEVERE CLEAR in an effort to support the sacrifices of our troops, learn more about issues such as post traumatic stress disorder (PTSD) and present the historical facts behind the Operation Iraqi Freedom. GOVERNMENT AND INSTITUTIONAL LICENSE. 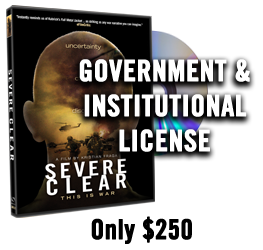 This version of SEVERE CLEAR includes a site license for public performance and educational use in government agencies, institutions and non-profit organizations. This license is not designed for events where you charge admission. We encourage government agencies, institutions, corporations and non-profits to organize screenings and educational courses around SEVERE CLEAR in an effort to support the sacrifices of our troops and issues such as post traumatic stress disorder (PTSD). PUBLIC LIBRARY LICENSE. 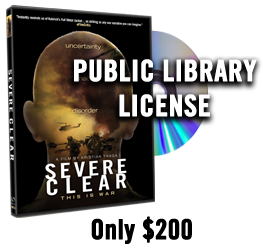 This version of SEVERE CLEAR includes a site license for public libraries including the libraries’ lending programs to their authorized cardholders. This license is not designed for events where you charge admission. 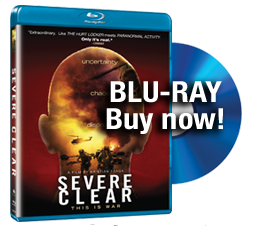 We encourage public libraries to organize screenings and educational courses around SEVERE CLEAR in an effort to support the sacrifices of our troops and issues such as post traumatic stress disorder (PTSD).